Minimal, abstract, allegorical and difficult to endure. Kaneto Shindo’s Onibaba is all of these things, but somehow manages to pull a trump card and leaving you horrified. In a good way. Set sometime in the 16th century, a quarrel between rival emperors has torn feudal Japan apart. Rather than focus on the brutalities from the front line, Shinado presents the vicarious effects that war can have in a small, otherwise placid rural setting. While they wait for their man Kichi to return from civil war, a peasantry woman (played by Kaneto Shindo’s own wife, Nobuko Otowa) and her submissive daughter-in-law (Jitsuko Yoshimura) have taken desperate measures to survive, murdering any soldiers who wander through their inescapable high grass patch, dumping their bodies into an ancient hole and exchanging the armour for food with local blackmarketeer Ushi (Taiji Tonoyama). The peasantry life is gruelling, but just bearable, until their reprobate neighbour Hachi (Kei Sato) comes home from the battlefield, torn from his armoury and bearing bad news. Hachi’s primitive, surprisingly contagious sexual desire threatens to disrupt the two women’s fragile interdependence, leading the older woman desperately attempting to keep balance of the constant corruption. I won’t spoil the reason for the mask, but safe to say it’s pretty important. Onibaba is a slow, meditative film, and certainly not for everyone. The epitome of showing-over-telling filmmaking, the first hour presents a day in the life of our unnamed female protagonists going about their painstaking daily routine. Shot so lusciously in crisp black and white by cinematographer Kiyomi Kuroda, we see them fetching water, slovenly tucking to to bowls of rice, catching livestock like prey and left restless and perspiring throughout the humid night. Shindo doesn’t just want to explain the tough, barbaric rituals of this world, he almost wants us to experience it first hand through a beautiful, cinematically raw aesthetic. That’s not to say that Onibaba is minimalist and visceral throughout, with Shindo tying it all together with a great deal of social commentary. To some degree, the film explores contemplative issues such as women’s role in Japanese society, the omniscient suppression of religion, inescapable sexual politics and the impact of war on society. Most interestingly, the film takes a undermining stance on capitalism, with the hidden pit at the centre of the field, fed by the strong and devouring the weak, serving as a poetic allegory. 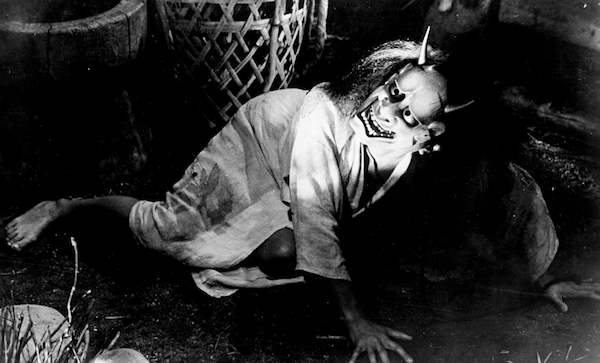 As a committed communist filmmaker (the film was produced by his polticially independent production company Kindai Eiga Kyokai), Shindo’s attack on callous dog-eat-dog mentality and survival of the fittest, quickest and greediest once again heightens the sense of unease and terror prescribed to Onibaba. As the cherry on a particularly unsettling cake, the soundtrack from Hikaru Hayashi is memorable and merciless. A free jazz collage of primal drums, vociferous saxophones and moody chanting bleakly swarming through this amoral setting like a gust of tumultuous wind. Onibaba is an austere portrayal of lust, jealousy and raw hunger. The result will certainly be a turn-off for some, but if you let it in, Onibaba is an entrancing and horrifyingly stark portrayal of the human psyche. This entry was posted in ★★★★★ (5) and tagged Civil War, Hikaru Hayashi, Horror, Japanese cinema, jazz, jITSUKO yOSHIMURA, Kaneto Shindo, Kei Sato, Kindai Eiga Kyokai, Nobuko Otowa, Onibaba, Taiji Tonoyama, War films. Bookmark the permalink.